Family Dogs and growing babies....life, lessons and love! : Good manners = more opportunities! Dogs that have been taught and have practiced their basic manners can easily be included and enjoyed once baby arrives. 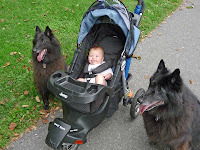 Practicing walking with your dogs and the stroller before your baby arrives will make this a seamless transition. Adding weight in your stroller while you practice will help simulate the experience of how it will feel once your baby is in the stoller. This also helps in steering. You will be glad you have practiced your walking manners ahead of time. If you need support with your dog on loose leash walking or basic walking manners please contact one of a preseter near you or ask us for a referrel.